Beware Those Offering to Consolidate Your Debt! 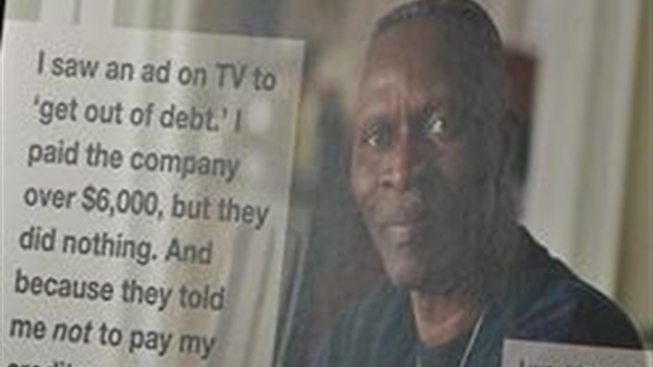 You've seen the ads, promising to cut your debt in half, that often sound too good to be true. During these tough times, the ads appealed to Harlem resident Carlos Gaviria, who paid $348 to a debt settlement company. But he says he got nothing except a mounting pile of bills. So did Carmen Santiago, of the Lower East Side, who paid a debt settlement company up front and said she figured her creditors were going to be taken care of "because what they tell you is not to tell the bank." Debt settlement companies though, are the top fraud concern in New York City for four years in a row, according to the city's Department of Consumer Affairs. Commissioner Jonathan Mintz warns that "these fee-based debt settlement services are almost never successful." On Tuesday, Mintz issued subpoenas to 15 companies with the most complaints. He said investigators and lawyers will look into promises made to consumers and whether the companies delivered. For those who don't, "there'll be consequences." America Debt Free, CF Capital Financial Group, Cooperative Credit Union Management, Credit 911, Debt Remedy Advice, Debt Rx USA, LLC, Diamond Financial Group, Global Debt Management, iCorpFunding, Life Coach Inc., New Path Financial, Right Start Financial, Square One Debt Settlement, United Debt Resolution Group, The Resolution Group. Mintz says the companies often charge a fee up front, ask for money into an account, but never send those funds to your creditors. NBC New York attempted to get comment from all the companies listed. Some had disconnected numbers, some did not return messages and others had no contact information. Save your paperwork. Consumer affairs says fewer than 1 percent of all debt-settlement companies deliver what they promise. Instead, you can turn to one of the city's 20 Financial Empowerment Centers throughout the five boroughs, for free help. You can find the one nearest you by dialing 311. Mintz says "our financial counselors can help you negotiate with your creditors as opposed to ignoring them, and work out reasonable payment plans."